At least 135 people, the majority Fulani herders, were massacred in central Mali on Saturday in the deadliest single recent attack in a region where ethnic and jihadist violence is escalating. 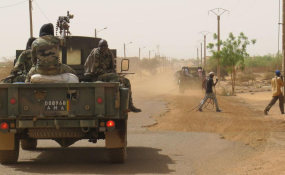 The attack was launched on the Fulani village of Ogossagou in the region of Bankass, close to the border with Burkina Faso. The victims were shot or hacked to death with machetes, said a security source. But since 2014 jihadist fighters in the area have been fomenting further violence. A group led by radical Islamist preacher Amadou Koufa has recruited mainly from the Muslim Fulani community leading to an increase in inter-ethnic violence. In January, Dogon hunters were blamed for the killing of 37 people in another Fulani village, Koulogon, in the same region. And last year, 500 civilians died in similar clashes, according to United Nations figures. "It means that conflicts between different socio-economic groups which would have used clubs now involve Kalashnikovs, causing many more victims," he told RFI. "Revenge attacks are also far more violent." "The army itself is being targeted by these attacks so it's much more preoccupied [...] in protecting itself against the [jihadist] threat. "The local population is in disarray faced with the insecurity," he added. "It means they turn to self-defence groups or take up weapons individually to cope with it." "Investigations are opened but can be difficult to conclude," he said. "You need to be able to collect information at a precise moment in areas which are not always accessible due to the security situation. Many enquiries have been launched over the last few years but weren't completed."